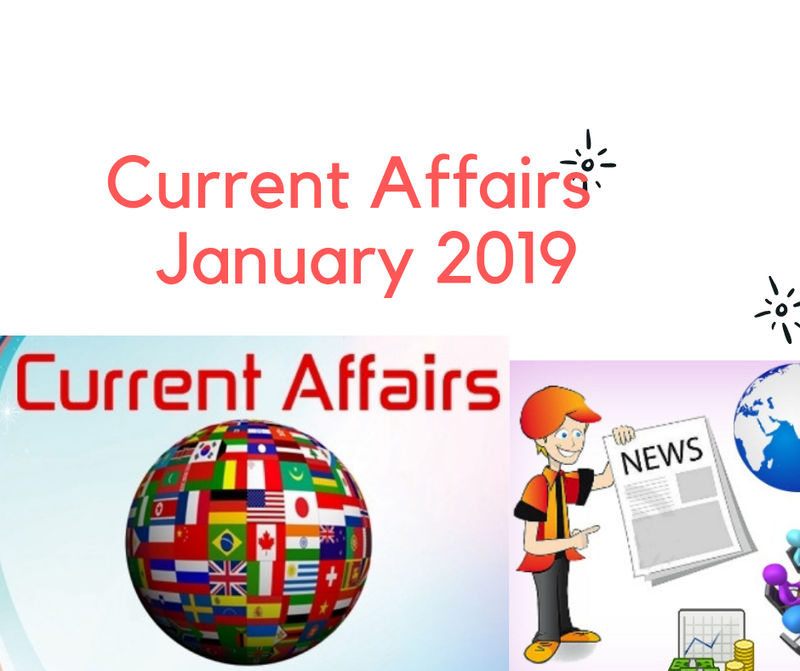 Current Affairs January 2019: Hello everyone, we are starting a new monthly series for Current Affairs where you'll find all the current affairs from each month that will be updated on a regular basis. These current affairs will help you a lot for your preparations in competitive examinations or for sharpening your knowledge, either way, you will be benefited. As we are committed to providing you with all the information and here to motivate and walk together through your success we have ensured to start from scratch. We have provided you the Current Affairs January 2019 just to make sure that you don't miss out on anything as these are very important for any competitive examinations. We will soon upload the next installment of the Current Affairs January 2019 and from now onwards this series is only going to grow and we will bring you with all the information on our website about the Current Affairs from every month. Make sure you keep following our websites to get the latest current affairs and other information. Here are the Current Affairs January 2019, those are the most important current affairs for all the upcoming competitive examinations. Q1. World Hindi Day is celebrated on? Q2. When is National voters day? Q3. National Girl Child Day and 1st International day of education are celebrated on the same day. When is it? Q4. What is the theme of the National Girl Child Day? Ans: Empowering girls for better tomorrow. Q5. Who is the ICC test player, ODI player and the Cricketer of the year? Q6. The author of the book “changing India” is. Q7. Who is the winner of the 1st ever Philip Kotler presidential award? Q8. Who is the IIC women’s cricketer and ODI player of the year 2018? Q9. Name the 1st Cricket team in the world to win 1000 international matches. Q10. Which is the 1st state in India to implement 10% quota for EWS? Q1. Current account deficit of the year 2018-2019 is? Q2. Fiscal Deficit for the year 2018-2019, 2019-2020, and 2020-2021 is estimated to be? Ans: 3.4% , 3.4%, and 3% respectively. Q3.Standard Deduction Limit is increased to? Q4. Defense Budget of the year 2019-2020 is? Q5. TDS threshold of the rent is increased to? Q6. The outlay for The Rashtriya Cow Mission is set to be? Q7. Allocation for the National Education Mission for the year 2019-2020 is? Q8. The size of the Indian economy in the next 5 years to estimated to be? Q9. The gratuity limit for the year 2019-2020 has increased to? Q10. The amount of Rs 600/- per annum will be given to the farmers from the year 2019. Name the scheme? Q1. Khelo India Youth game 2019 was held in? Q2. India Africa field training exercise was held in? Q3. The venue for the Indian Science Congress 2019 was? Ans: Lovely Professional University, Jalandhar Punjab. Q4. The venue for the India Myanmar bilateral exercise 2018-2019 was? Ans: Chandi Mandir Military Station, Haryana. Q5. ITC Academy Bridge 2019 conference was held in? Q6. Mega Silk event 2019 was held in? Q7. Nation Workshop on street vendors was held in? Q8. The venue for the women’s 4-nation tournament (hero cup) was? Q9. 7TH annual World Government Summit was held in? Q10. Senior National Badminton Championships 2018-2019 was held in? Current Affairs are one of the most important aspects which you must have to cover for successfully cracking a competitive examination. Current affairs hold a major amount of marks and it becomes necessary for you to look at the current affairs before appearing the exam. This is what that brought us to bring this series only for you as it is going to help you to deal with all the major current affairs. Here, we provided you the latest Current Affairs in January 2019. If you have any questions or query or any other information related to this article, you can let us know by dropping a message through the comment box below. We wait for the feedback and suggestions from everyone reading this article.